Tomorrow is National Signing Day, so there are a bevy of recruiting notes flying around. I thought it would be prudent to post them here so we are all informed. Tomorrow will be a breakdown of all the signing action, and class ranks and what have you. The first note is from basketball. On the heels of his outstanding performance against Providence, Cashmere Wright is the Big East Freshman of the week. Congrats out to Cash, let's keep it going. A couple Senior Bowl notes to start. Tony Pike started and was 5-12 45 yards. Tony also had 1 run for 6 yards. Not a great day. Mardy Gilyard had a huge day with 5 catches for 103 yards and a touchdown. He also averaged 26 yards on kick returns, and 12 on punt returns. Mardy's success was noted by CBS' Rob Rang. Recruiting news and rumors and news. Winton Woods product Dominique Brown made his collegiate decision, and it was Louisville. The sticking point between UC, Ohio State and UofL was playing quarterback. I guess he wasn't going to see action in Columbus or Cincy the next couple years, and Louisville's QB prospects are wide open after roughly half the state of Kentucky took snaps last season. Former UC recruit Luke Massa ended up choosing to attend Notre Dame. This wasn't a surprise because he's in love with Brian Kelly, and he would follow BK through the gates of hell. Luke Massa is really dedicated. North Ft. Meyers WR Tre Boston, such an awesome name, was going to attend UC, but has chosen to go to smelly North Carolina. I don't know why someone as cool as Tre would want to go to a place where you aren't allowed to wear shoes, and where there is so much tar lying around that it will get stuck to your heels. Seems like a bad place. Let's wrap things up with some good news shall we? We shall, good call. WR Anthony McClung, from Pike HS and teammate of Dyjuan Lewis, had switched from Louisville to Cincinnati. Anthony is a do it all slot receiver, and I think he could make a big impact at UC. He was a Wildcat QB for his team, and it would be interesting to see if he would perform that role here. McClung chose UC after not being sure what was happening with Louisville. He said Louisville tried to switch his position and grey(red) shirt him. 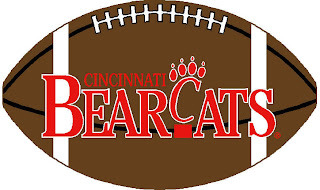 With McClung, Lewis and Vidal Hazelton joining the fray, UC looks to be loaded at receiver. That's all for this Tuesday edition of UC Notes. I know you are all waiting for Lost tonight, and anything you can get your hands on to pass the time is gravy. I have no idea when national signing day ends, but I'll put something up right after, and I'll try my best to keep you updated through the day. I hope Massa enjoys riding the bench in South Bend. What are the odds that he tranfers out after a year or two of holding clipboards?